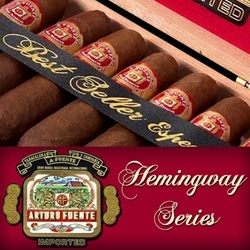 Introduced in the early 1980's, the Hemingway series by Arturo Fuente Cigars is rated as one of the finest hand rolled premium cigars available today. Named after the famed American novelist who loved a good cigar, these hand rolled gems are finely crafted with aged, mild-medium Dominican filler tobaccos, a Dominican binder and a delicate West African Cameroon wrapper. Once ignited, this hand-rolled premium cigar produces a rich, medium bodied smoke with earthly taste tones of earth and woody flavors finishing off with an aroma of cedar, citrus, spice and cream. The Arturo Fuente Hemingway Series will make a great addition to your "must smoke" cigar list. Find out what cigar enthusiasts already know and stock your humidor full with any of the premium hand rolled cigars listed below. If you looking for a great smoke at a great price, the Arturo Fuente Hemingway Series are hand rolled premium cigars that deliver time and time again. Smokers Discounts has made it easy and affordable to buy premium cigars online. A variety of sizes and flavors are listed below. Each of these styles are in stock and available. Call us for more details!